Once again the focus on Sunday, Dec. 16, will be on the top 2-year-olds in Japan, when the Grade 1 Asahi Hai Futurity Stakes will be run at Hanshin Racecourse over a mile on the outer turf course, the same course and distance as last Sunday’s Grade 1 Hanshin Juvenile Fillies, which saw jockey Cristian Demuro ride a confident race on star filly Danon Fantasy, to register the rider’s third JRA Grade 1 victory. 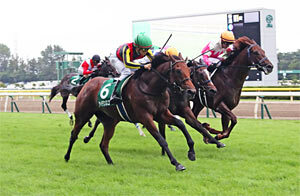 This year’s Grade 1 Asahi Hai Futurity Stakes has attracted 16 nominations, among them two fillies. Connections now have another choice when they consider the options for the youngsters, with the recently upgraded Grade 1 Hopeful Stakes over 2,000 meters at Nakayama Racecourse rounding out the year’s top class races on Dec. 28, a race that now attracts possible runners for next year’s Classics. This Sunday’s race will be the 70th running of the Asahi Hai Futurity Stakes, a race that was previously run at Nakayama until 2014, when it was switched to the Hanshin track. Race conditions state that no geldings are allowed and that fillies can claim a 1kg allowance. Some of the big name winners to have won the race include Narita Brian (1993), Fuji Kiseki (1994), and Rose Kingdom (2009), the 2010 Japan Cup winner. In the last 10 years, four first favorites have won the race, the latest last year, when Danon Premium set a new record time for the race since it’s been held at Hanshin, winning in a time of 1 minute, 33.3 seconds. Step races leading up to this year’s Asahi Hai Futurity Stakes have included the Grade 3 Saudi Arabia Royal Cup run over a mile at Tokyo in October, Grade 2 Daily Hai Nisai Stakes over a mile at Kyoto, and Grade 2 Keio Hai Nisai Stakes over 1,400 meters at Tokyo, the latter two races both being run in November. First place prize money this year is JPY 70 million. Gran Alegria: One of two fillies nominated, Gran Alegria is testimony to the number of strong 2-year-olds under the watch of trainer Kazuo Fujisawa, that he’s able to pitch her in here among the colts, and what’s more she could very well be the favorite come race day. The trainer won the race in 1995 (Bubble Gum Fellow), and more recently in 2016 (Satono Ares). Gran Alegria won her debut race in June, and then filled out 18kgs before winning the Grade 3 Saudi Arabia Royal Cup over a mile at Tokyo in October. Her winning distance was 3 1/2 lengths. In a piece of work on the polytrack at Miho Training Center on Dec. 5, she clocked a five furlong time of 68.4 seconds, with a final furlong time of 12.3 seconds. “She’s not a horse to put in really fast times, but her action and movement were good,” the trainer stated. The filly by Deep Impact will be ridden by jockey Christophe Lemaire, whose incredible year is not finished yet. Fantasist: By star stallion of the year, Lord Kanaloa, Fantasist is three wins from three starts, and the first came in his debut race in July. 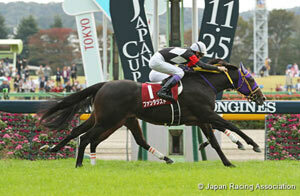 Since then he’s added the Grade 3 Kokura Nisai Stakes and the Grade 2 Keio Hai Nisai Stakes to his list of victories. One man who’s certainly hoping he can win is jockey Yutaka Take, who rode his 4,000th JRA winner earlier this year, but has never won the Asahi Hai Futurity Stakes. 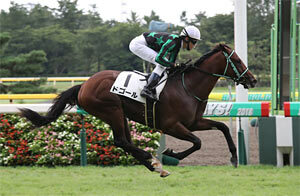 Fantasist is owned and bred by Toshihiro Hirosaki and is trained by Tomoyuki Umeda. Admire Mars: Another colt with a 100% win rate is Admire Mars, a son of Daiwa Major. He’s won all three of his starts under jockey Mirco Demuro, a recent victor in the Champions Cup, and a three time winner of the Asahi Hai Futurity Stakes, most recently with Leontes in 2015. The horse was bred at Northern Farm, is trained by Yasuo Tomomichi, and is coming off a win in the Grade 2 Daily Hai Nisai Stakes over a mile at Kyoto in November. Cadence Call: Also bred at Northern Farm, Cadence Call is another colt by Lord Kanaloa and is trained by the man who also trained the sire, Takayuki Yasuda. All three of Cadence Call’s races have been over a mile, and he’s won twice and finished second once. 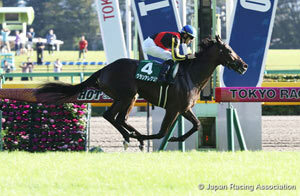 His latest win was when he justified favoritism in the Grade 3 Niigata Nisai Stakes over a mile in August. Deep Diver: A half-brother to Kitasan Black, the dark bay colt has been slightly unlucky in registering four seconds from six career starts, winning once and finishing third once. His win came on soft ground, suggesting he can handle any going. He’s coming off a second place finish in the Shumeigiku Sho over 1,400 meters at Kyoto in November, and is trained by two-time JRA Grade 1 winning trainer, Ryuji Okubo. De Gaulle: Along with a few of the other nominees, De Gaulle has just had the two starts, winning on his debut in September over 1,400 meters at Niigata, and then having to settle for second behind Gran Alegria in the Grade 3 Saudi Arabia Royal Cup last time. The Sakura President colt runs in the colors of Kanayama Holdings Co. Ltd., and jockey Akihide Tsumura and trainer Yoichi Kuroiwa will be hoping the horse can lift them beyond their Grade 3 titles, which is the highest level of success they’ve achieved in their careers so far.